With a year and a half of store ownership (and two years since I began putting my business plan into action), I still have so much left to learn. It gets easier, that's for sure, but things happen just about every day where I think, "Hmm, what should I do in this situation?" or where I use Google or my mentoring resources to solve a problem. I definitely feel like I'm finally at a place where I don't second-guess every decision I make and where I've finally come to terms with some of the inevitables of retail (like the fact that you just can't predict store traffic). I'm fortunate to have mentors and collaborators in the industry that I can "talk shop" with and that is always incredibly helpful. It's also important to have those collaborators instead of viewing every other store owner in your industry as competition - it's helpful for no one. 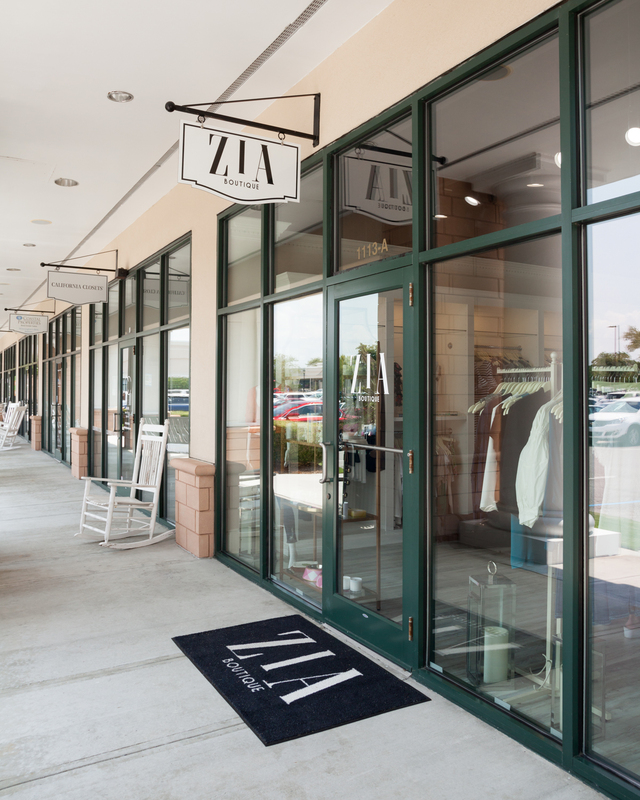 The following doesn't even begin to encompass everything that comes with opening a retail business, but it will give you a brief overview of what my experience was like! (And as a reminder, this is my personal experience so I can't speak for what is like for other business owners). This is the #1 question I'm asked in regards to opening ZIA Boutique. From the time I was a little girl, I told my parents I wanted to open a store. 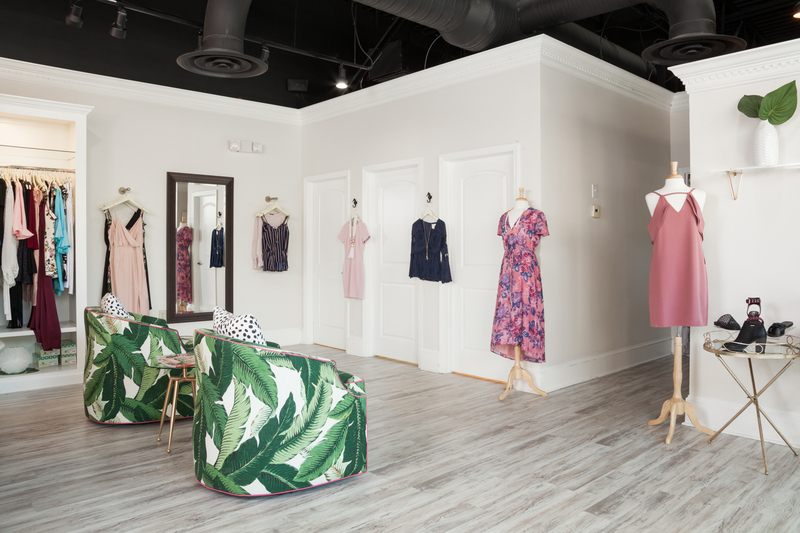 I remember seeing an article in a local magazine about a new boutique opening and I was both inspired and envious as I desperately wanted to tackle that for myself. I remember it clearly - I was sitting on the floor of my parents' kitchen after working out and I said to them, "I just really want a store." I had said it for years but this time, my dad said, "Well, if this is something you really want, now's the time to do it." I was newly engaged, working in a job I really loved, so I was overwhelmed at the thought of planning the wedding & quitting the security of a "normal" job, but I decided to at least investigate. I put together a business plan - it looked very professional, though the realities of what things are like vs. what I imagined are laughable! Despite the fact that some of my numbers weren't quite realistic, I did my research. I looked at brands that weren't in Wilmington, I read tons and tons of articles about store ownership and the retail industry, and I even visited my prime location (and the shopping center where I ended up) so I could have an accurate idea as to what rent would cost. I presented a portfolio to my business advisor and while he warned of the hardships of retail, he was was supportive and on board with my concepts and so we made the move to get things rolling. Location scouting began after that. I had a hard time committing to a space as I knew where I wanted to be, but it's also a premium location so rent is a huge factor. There were several space options and the one I liked ended up getting leased by someone else as I wasn't quit ready to commit. Finally (several months later), we locked in the space with a target open date of mid-summer. The space I ended up with was actually where I really wanted to be, but was a bit larger which made me hesitant. However, I can't imagine the shop being anywhere else (at least right now)! I first looked at it on January 27th and fell in love with the bright light and large wall of windows. Set up store - inventory in system, steaming, tagging, store layout, furnishings, etc. There is so much more to the above timeline, but that's a brief overview of how it went! What was the process of renting space? I touched on this a little bit in the above but I had a pretty decent idea as to where I wanted to be located based on the brands I wanted to carry, price point, etc. I spent a lot of time searching through online rental listings but even more time driving around town and looking at spaces that looked vacant. Several times I came up empty handed because the spaces were empty but spoken for. Some didn't work due to being too large or too small. One space I liked, but I didn't like the parking situation, so I skipped that one. Ultimately, I kept coming back to the center where my store ended up and though it took some time negotiating lease space, coming up with a timeline, and figuring out the exact right spot, I'm happy with where we are. 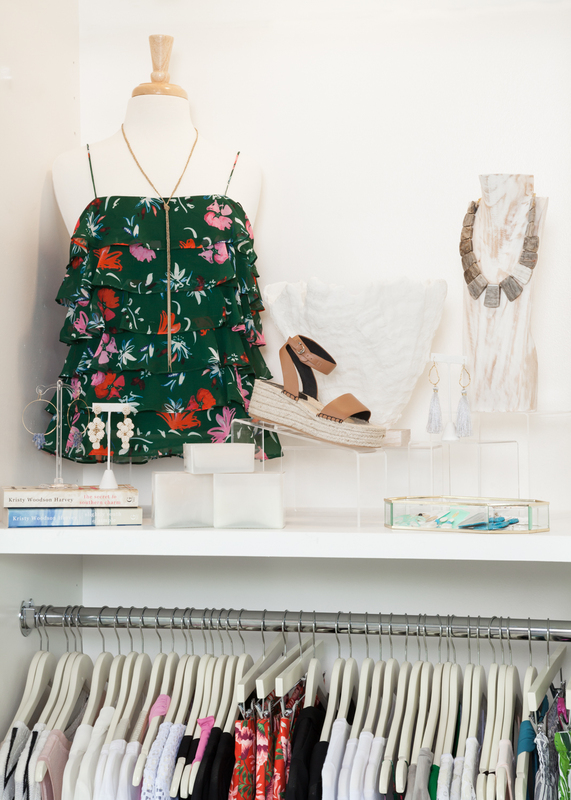 What could one expect to spend when opening a boutique? What was one expense you overlooked or that you weren't expecting? The first part is a tough one as it honestly depends on location, cost of inventory, lease terms, etc. My ballpark number for what I thought it would take to get started was not quite right, as there were certain things that I under (and over)-estimated. Insurance costs are definitely one of those much needed but pesky expenses that I never even thought about in the beginning. I also definitely underestimated the cost of what my ideal build-out would be. I ended up scaling back on a couple of my initial build-out ideas so that I could have better quality on some of my bigger projects (like my custom cabinetry and cash wrap). How do you acquire brands for your store? Prior to attending market, a lot of what I did was scouring Instagram and online to find brands that I liked. I hit a lot of dead ends at first, and it made it frustrating. Thankfully, brands offer distribution protection, meaning that in most situations, the store next door can't carry the exact same things as you. As a store, I'm thankful for that! But that also meant that I couldn't carry a lot of my favorite brands because other places were already carrying them (even if it was only one or two pieces). That being said, it made me dive deeper and try to find brands that had either never been found in Wilmington or that maybe had previously been in another store but were no longer being carried. My first market trip was in April 2017, and very few people even knew I was opening a business, so I was carrying the weight of all of it on top of literally having no clue what I was doing. Mom and I went to Atlanta for our first market and I remember her looking at me and saying, "Are you going to be okay?" I thought I was going to be sick at some points because I was signing my name to thousands of dollars of inventory with no clue if I would develop as to if I would have any customers! It was a very overwhelming experience. Despite that, my mom and I had a great time diving into our first market trip and finding brands that we felt would be a good fit for the shop. What are the legal things you have to do? The legalities of owning a business was one of the things that stressed me out the most! I wanted to make sure I had everything correct. I created my business as an LLC and that was the very first thing I did. I have to provide my EIN to every new vendor I work with to prove I am a valid business and I also have to have my NC Resale Certificate. I provide that as well and it is also displayed in the store as evidence that I am a valid retailer. Did you have a mentor to work with you in the beginning? Starting a brand new business is hard! I definitely had some mentors, though I didn't really have anyone to reach out to that was in my direct industry. My parents were huge resources for me as they have both been business owners (my mom owned a dance studio for years and years and my dad is a general contractor & part-owner of a boat company). Despite being able to pick their brains, they didn't have specific retail knowledge which was difficult at times, so I felt like we were all learning together. My business advisor was (and still is) a huge resource for me. He helped me get my business plan tailored, walked me through QuickBooks, helped me with tax documents and made sure I had correct legal documents. I still will randomly call or text him with a random question I should probably know the answer to, but he's always quick to give me the correct answer. I also consider my husband a mentor throughout all of this - he is much more "math-minded" than I am, so he helps me with a lot of numbers things and he's also my sounding board (along with my parents) for just about every business decision I make. Now that I am actually up and running, I've been very fortunate to connect with bright and inspiring people in the creative and business industries. Lindsey Cheek, owner and designer for Gathered Group, was and still is a big mentor for me. She has given me so much advice in being a young female business owner and also walked me through some hard decisions I had to make early on. 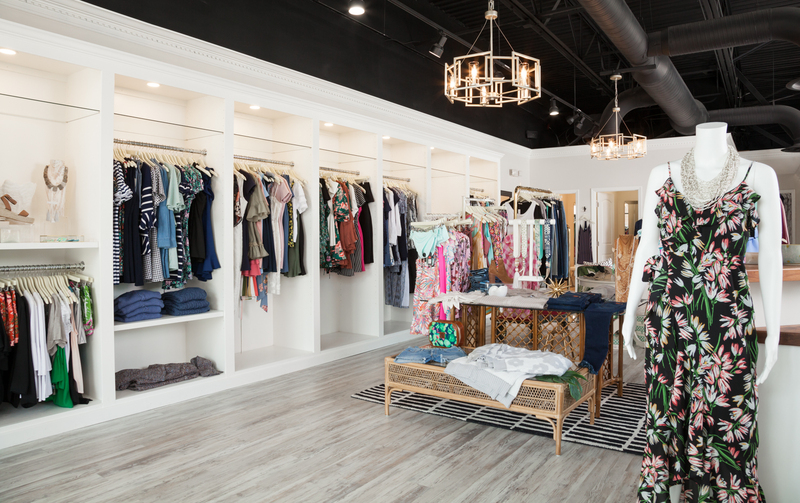 I also love connecting with the other boutiques here in The Forum (my shopping center) - they are all locally owned and operated and the owners are in the shop most every day, so every so often we get together to chat and brainstorm on ways we can collaborate. What is a hard or non-glamorous part of your job? Though this job is rewarding, there are definitely some hard parts! One of the toughest parts to me is managing people and sticking to policies. I've had some sort of manager role for the better part of 5 years, but being the ultimate boss is still a tricky one for me. I'm a people-pleaser, so it's sometimes hard to stick to my guns and address issues that arise. It's also hard for me to stick to our policies because I want every one to have a great experience, but another friend of mine told me, "Policies is what will make you successful." You have to find the fine line of giving every one the ultimate customer experience without compromising your business. Another hard part is the fact that retail ebbs and flows. I remember the first day we were slow hurt my heart so much. We were just off of the opening month momentum and it was quiet. Now, I've just come to terms with the fact that retail is a tough biz to be in. There are weeks when people love to shop and others where they just aren't into it. So instead of dwelling on that, I spend that time coming up with new events, working on our website, and creating new ideas to reach new customers. There have also been some non-glamorous parts. Many days are spent putting together furniture or clothing racks, steaming, cleaning base boards, loading up a car for a pop-up, staying at the store extra late to make sure everything gets done because you're under-staffed... Steve has also had to put together quite a few pieces of furniture and I think he's now forbidden me from anything that has more than 10 pieces (haha). There are a lot of 12-15 hour days and the work doesn't stop when you leave the store. Despite all of that, those things are what makes this a small business. At the end of the day, it's me and my family and my sweet employees running the show and I love the fact that this little shop has a small-business feel. Blood, sweat and tears have gone into this place (literally all three) and I wouldn't have it any other way. What is your favorite thing about owning a business? It's pretty surreal to work for yourself. I remember walking into the store early one morning not long after we had opened, and I just looked around and could hardly believe that it had all come together. Similarly, as I closed up the shop on December 23rd to be closed through Christmas, I literally had tears in my eyes. There was a great Christmas song playing, the sun was setting, and our Christmas tree was lit. I was running numbers and feeling so thankful for a blessed holiday season. I have so many incredible customers and the people I have met are so rewarding. I do like the flexibility of being my own boss. It's still weird to me sometimes that I set the hours, "choose" when to work, etc. Even though I work long days and often weekends - and I feel like I'm glued to my phone and email even more now - I do like that I can occasionally sneak out for a random week day errand or appointment. The store has also opened up so many doors to connect with incredible people. This town is filled with smart, talented people - whether they are business owners or stylists or photographers or teachers or stay at home moms - they are all people with individualized talents and I feel blessed to know them. What is a good piece of business advice you have received? One of my best friend's dad is a long-time business owner and when I worked for a marketing and advertising agency as an account executive, he was also one of my clients. Every so often, he checks in, and as I was going through some difficult decision making, I said something about the fact that sometimes I'm a control freak and a little too type-A and that maybe I needed to lessen that aspect. His response is something I think about every day: "You should never have to apologize for the way you choose to run your business, if you are doing it in an honest and integrable way." From that point on, I gained a bit of confidence which has since empowered me to make other decisions. I hope you've enjoyed reading a little bit about my business opening experience! Have more questions? Feel free to leave a comment and I will get back to you ASAP! Thanks to Kelly Starbuck for the photos. You can check out her website here.